A Holocaust survivor was booked to speak in Pittsburgh. A massacre wouldn’t stop her. PITTSBURGH — Magda Brown was packed and ready to fly here when she heard the news. 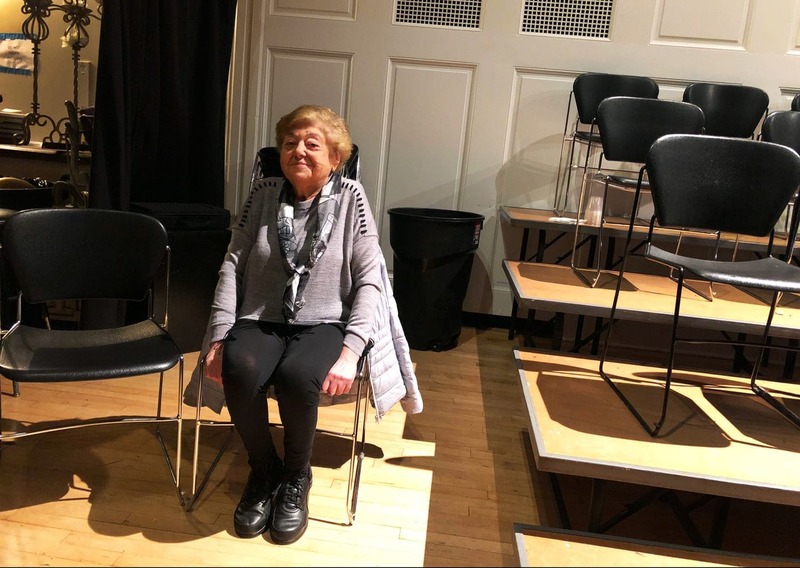 Her daughter sat her down and told her: A shooting at a synagogue, around the corner from where Magda was scheduled to give a presentation, the following day, about her experiences surviving the Holocaust. Was it all too much? Her daughter asked if she wanted to bow out or reschedule. Staff at the Illinois Holocaust Museum, on whose behalf Magda regularly gives speeches, wondered if it would be safe for her to take the stage at such a foreboding time, in such a raw place. So she and her daughter got on their plane in Chicago, landing Saturday in Pittsburgh hours after the worst attack on Jewish people in U.S. history. She is 91. No cane necessary. Thin legs in black tights. Manicured nails painted a dusty rose. She was buoyant and cheery, doling out “grandma hugs” in a chapel at Chatham University, in the same neighborhood as the synagogue. A short walk away was a heap of soggy condolence: Grocery-store bouquets. Thoughts and prayers on poster board, ink running in the rain. “SORRY,” proclaimed one, with blunt simplicity. The leaves had turned. The city was sitting shiva. The Steelers had won, after a moment of silence. And the pews were filling up at the chapel to hear Magda Brown. In times like these we look to our elders to sort things out, to put things in perspective. What does Then say about Now? Magda Brown has faced far worse than a country gone crazy with guns. She has a scarred bump on her left foot, from the wooden slippers at Auschwitz. Every step is a reminder. Then is not Now. And yet. Then: “The feeling that I have 5 million human beings on my conscience is for me a source of extraordinary satisfaction,” said Adolf Eichmann, the Nazi leader who coordinated the transportation of Magda and 400,000 other Hungarian Jews to concentration camps. Chatting backstage in the chapel, Magda was feisty and sharp. Among her notes was a printout of a poem by a fellow Hungarian Holocaust survivor. Hate has always been around, Magda said backstage, but it spreads faster now. The world is more connected, for better and worse. Anti-Semitic incidents in the United States spiked in 2017. She looks at Tree of Life, at the march in Charlottesville last year, and she feels an old fear. Horror starts slowly, here and there. In the details, she said. They reduce you step by step. It was time for her to go onstage. “I just hope the words come out right,” she said. She addressed her audience from an armchair. The chapel was full of Pittsburghers who wanted a story, a message, something, anything. Magda was a happy-go-lucky child, a spoiled brat blessed with a positive attitude. Her parents ran a meat market. Anti-Semitism was a part of life — Jews’ access to education was limited — but the Nazi invasion took it to unimagined levels. Step by step. First came the mandatory wearing of the Star of David. Then ghettoization, with 40 other Jews forced into Magda’s family home. Then, on her 17th birthday, the march out to the rail yards, with the promise that paid labor awaited them in another country. Then they were packed into cattle cars, for three solid days in the June heat. Then they were offloaded at Auschwitz-Birkenau, sorted according to gender and fitness, shaved and disinfected, fed green sludge for breakfast and black bread for dinner. The smell on the breeze — like charred chicken feathers — was the airborne remains of older Jews who had been gassed and sent to the crematorium. After two months of starvation, humiliation and torture, Magda was sent with other Hungarian women to a munitions factory in Allendorf, Germany, to help put bombs together. In the spring of ’45, with the Allies closing in, they were marched toward Buchenwald and intercepted by American soldiers. “God was watching over us,” Magda said. An orphan at 18, she found relatives in Chicago and immigrated there in late 1946. She met a nice Jewish boy named Robert Brown at a party and married him within a year. It wasn’t easy for him to grasp the depth of her pain, but he was a good man, compassionate and caring, and he gave her space to pursue her own interests. She took night classes in history and English and worked in a physician’s office as a medical assistant. They had two children, and Magda taught them never to hate anyone. Ever. Now she was here — 73 years removed from the Holocaust, one day removed from another mass shooting — with a message. It was nothing you haven’t heard before, but it meant something different because it came from her. Because the world once gave her every reason to despair. Have faith, she told Pittsburgh. Exercise determination and drive. Don’t train your children to hate. Push back on the deniers. Believe that tomorrow will be better. And jealously guard your freedom. The audience gave her a standing ovation. People lingered afterward to get a picture with her, to receive a grandma hug, to kneel at her feet and hold her hand and absorb some resilience from her. Then it was time to go. She had another appointment in the morning, with impressionable schoolchildren. Outside the chapel, it was cold and black and raining. She was not bothered by it. She remembered what her elders said.